Many people, particularly Android purists, of course, frown upon custom Android user-interfaces. They want the vanilla Android experience – Android the way Google made it, and usually think custom UIs look bad, are bloated, poorly made, and slow down the OS update process. In a way I agree, and I haven’t used HTC’s Sense interface on my HTC Desire since August last year. For nearly all of 2011, I’ve let various vanilla Gingerbread ROMs power my device. However, I feel a need to write a few words in defense of the custom Android UI. Phone manufacturers primarily equip its devices with custom user-interfaces to add value to them, and to differentiate its phones – make them stand out from the crowd. 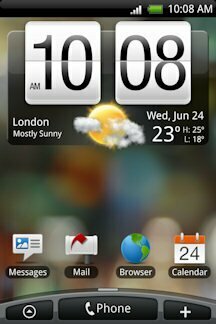 If you take a look at HTC Sense, for example, it’s hard to argue with the fact that it has a lot more functionally than vanilla Android. Some people may not need these features – but still, it improves upon stock Android in many ways. The main reasons why I personally believe custom interfaces are a good thing, however, are not because of features. After having used devices with the HTC Sense user-interface since September 2009, I know exactly what kind of experience it brings. Whenever I try a custom ROM based on Sense, I only end up using it for a couple of hours, because it’s all too familiar – even downright boring. Everything looks and feels the same. There is theme support now, but it’s still very much Sense. After having used vanilla Gingerbread for hours every day during the last three months, the same thing can be said about unmodified Android. I love it, but there’s nothing left to discover. I initially decided to not upgrade this year, but then I changed my mind. I write about Android a lot, and I want to be able to try out the latest games (and I’m also intrigued by the latest tech, hrrm). My point is; if I’m going to buy a new device, I don’t want the exact same experience that I’m used to, and only exchange the hardware for something new. I want new software as well. I want new details in the interface to discover, new things to optimize – I want a different look and feel, another experience than what I’m used to. As long as the device can be rooted, and that’s the case for nearly all new devices, I can always put vanilla Android on it myself, if I want to. It’s as easy as flashing a custom ROM and that takes about 15 minutes. Then I’ll always have a custom UI to fall back on, unlike if I buy a phone with vanilla Android from the start. Besides, many users of Android phones that feature vanilla Android out of the box replace it with CyanogenMod anyway. Then I really don’t see the point of buying a vanilla Android phone? I say, keep the custom interfaces coming – but please make them good. Then again, given how popular iPhones are, it’s obvious that many users are of an entirely different disposition: they want the exact same old, comforting experience. However – I can’t be the only one who wants something new, fresh and different, surely? Looks good, by the way I got a new job in multinational company & my job requires me to fly frequently. I am looking for a telephone company which can provide me services at cheap & affordable price. I heard about Telestial & found they provide international cell phone rentals at very cheap rate; do you guys have any idea about it?